On a world scale coral reefs are in decline. Over the last 30-40 years 80% of coral in the Caribbean have been destroyed and 50% in Indonesia and the Pacific. Bleaching associated with the 1982 -1983 El-Nino killed over 95% of coral in the Galapagos Islands and the 1997-1998 El-Nino alone wiped out 16% of all coral on the planet. Globally about 1% of coral is dying out each year. So how does hot water kill coral? It requires both high water temperatures and sunlight. Oxygen is released as waste during photosynthesis and like all chemical processes this is affected by temperature, speeding up as more energy (warmth) is applied. When water temperatures rise too high the protective mechanisms to prevent heat damage, employed by the coral and the algae, are overwhelmed. The zooxanthellae algae produce high levels of oxygen waste which begin to poison the coral polyp. In acts of self-preservation the coral kick out the algae, and in doing so become susceptible to starvation, opportunistic diseases, competitive seaweeds and macroalgae (slime to you and me) . Coral can succumb to the effects of bleaching years later, and for those coral that survive, growth effectively ceases and full recovery can take anything up to a decade. And what happened with this paper? "Crown-of-thorns starfish (Acanthaster planci) outbreaks and storm damage were responsible for more coral loss during this period than either bleaching or disease despite two mass bleaching events and an increase in the incidence of coral disease. While the limited data for the GBR prior to the 1980's suggests that coral cover was higher than in our survey, we found no evidence of consistent, system-wide decline in coral cover since 1995. Instead, fluctuations in coral cover at subregional scales (10–100 km), driven mostly by changes in fast-growing Acroporidae, occurred as a result of localized disturbance events and subsequent recovery." "Corals have an intimate symbiotic relationship with single-celled algae, zooxanthellae, which live in their cells and provide the photosynthetic fuel for them to grow and reefs to form. The research showed that this Ecosystems can recover from all sorts of abuse, and coral reefs are no exception. relationship can be surprisingly fragile if corals are exposed to high light conditions at the same time as above-normal water temperatures, because the algae produce toxic levels of oxygen, and excessive levels of oxygen are toxic to most animal life. Under these conditions, corals must expel the zooxanthellae, bleach, and probably die or succumb to the toxin and definitely die. A tough choice, one they have not had to make at any time in their long genetic history." "The critical issue with global warming induced coral bleaching, as it is for many eco-systems, is the speed of warming. They are simply not being given sufficient time to evolve tolerance"
As for the Great Barrier Reef (GBR), the worst mass coral bleaching episode was back in 2002/2003. The ocean has steadily gained an enormous amount of heat in that time, and the GBR appears to have been protected by a largely La Nina-dominant pattern - especially since 2005. Sadly this is unlikely to last. I'll have a post on this topic soon. I know there are other factors which can change the ph levels but bear with me. In polar waters, its already co2 rich so the ph level should be very low in comparison to tropical waters. Vonnegut: Temperature of ocean water is not the only factor affecting the pH of the oceans. Among other factors, an important one is the partial pressure of CO2 in the air. You've already been pointed at the thorough explanation in the series of posts OA Is Not OK. Read them, please, and if you have relevant questions after reading, then post questions there. Vonnegut, have you seen the company Sustainable Oceans Pty Ltd www.sustsainableoceans.com.au? They specialise in relocating coral. Currently its usually relocated because of development we don't need or want. But in future they hope to use their technology for relocating coral to more temperate waters if climate change causes further ocean temperature rises and threatens coral survival. There seems to be some good news on the coral front. "Oops! It may not be ‘ocean acidification’ killing coral after all – common chemical found in sunscreen is poisonous to coral reefs"
(Rob P) There no evidence, as far as I am aware, of ocean acidification killing reef coral in the modern ocean. The decline in saturation state and the increase in hydrogen ions (falling pH) are likely making calcification, the building of coral's calcium carbonate skeleton, more difficult though. This is because coral build their skeletons in internal chambers semi-sealed off from the ambient seawater and need to pump hydrogen ions out of the chamber in order to raise the saturation state. It permits aragonite crystals formation in this highly supersaturated environment. Lower ocean pH, as ocean acidification is currently doing, and you increase the concentration of hydrogen ions dissolved in seawater. Coral therefore have to expend more energy in pumping these ions out of the calcification chamber. It's problematic because, like many organisms, the energy budget is very tight and they can't afford to use up energy allocated to reproductive purposes. Skimp on calcification and the coral skeleton will become weaker. And there is evidence that it is indeed occurring at some locations. "It may not be ‘ocean acidification’ killing coral after all..."
"A greater threat to corals than warming and acidity may be..."
The operative phrase is "may be". Further study is required to quell the pell-mell rush down the steep path to Hyperbole land. It strikes me as ulikely that sunscreen is harming corals in remote Hawaiian islands with no tourists, the Great Barrior reef where tourists do not go and in many other remote locations. Even if it were poisoness enough to affect corals in the ocean, which I doubt, it would only affect the most visited locations. Corals are bleaching across all the world’s oceans in only the third die-off of its scale in history, scientists have revealed. El Nino and a Pacific warm water mass known as “The Blob” are combining with human-caused climate change to drive record high ocean temperatures. 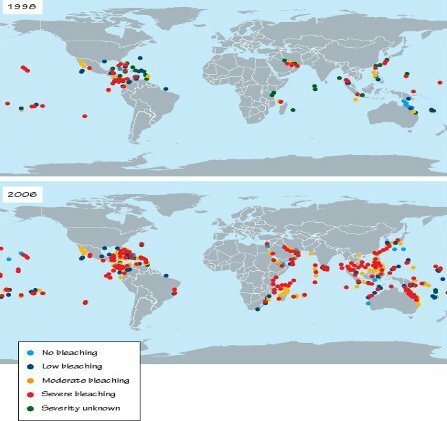 These hostile conditions are expected to deplete more than 38% of the world’s reefs by the end of 2015, according to the US-based National Oceanic and Atmospheric Administration (NOAA). Recent damage to corals in the Caribbean follows bleaching in the Pacific and Atlantic oceans earlier in the year, confirming the phenomenon as global in scope. It has knock-on effects for species that rely on healthy corals for food, as well as for people who make a living from tourism or fishing. “What really has us concerned is this has been going on for a year and is likely to last another year,” said NOAA coral specialist Mark Eakin. The El Nino weather system, characterised by a period of warm water across much of the Pacific, is forecast to remain strong until early 2016. I have trawled for this report everwhere university portals, Google and the AIMS website and its published papers index but without success. Has anyone any idea where this report in 'The Australian' by Amos Aikman originates? Cooper et al (2012) Growth of Western Australian Corals in the Anthropocene. If you have an author's name (here Janice Lough) and they are an academic, finding a list of their publications is a good step to getting on to their papers. From the abstract for the paper. "We show there is no widespread pattern of consistent decline in calcification rates of massive Porites during the 20th century on reefs spanning an 11° latitudinal range in the southeast Indian Ocean off Western Australia. Increasing calcification rates on the high-latitude reefs contrast with the downward trajectory reported for corals on Australia's Great Barrier Reef and provide additional evidence that recent changes in coral calcification are responses to temperature rather than ocean acidification." Huh! This is a classic Black is White piece from the Australian. There is a downward trajectory to calcification in the GBR, in warmer water, in contast to the cooler waters at higher latitude in the southern Indian Ocean. "Seawater carbon chemistry is a key determinant of coral calcification, and the potential for future anthropogenic-influenced declines in carbonate saturation state, and hence coral calcification, is cause for serious concern (2,4,7). However, we conclude that the rate of change in the thermal environment of coral reefs is currently the primary driver of change in coral calcification rates. Warming SSTs are resulting in (i) increased calcification rates reported here in the southeast Indian Ocean, where marginal reefs have taken advantage of warmer conditions, and (ii) recent declines reported elsewhere for more typical reef environments where thermal optima for calcification have been exceeded or resulted in setbacks in growth as a result of thermally induced bleaching. Whether the former is sustainable as oceans continue to warm is another question." Thanks MA Rodger, I didn't have access to the full article. Either way it doesn't support what the Australian reported. Western Australian coral were devastated by the marine heatwave of 2010-2011. See: Unprecedented Mass Bleaching and Loss of Coral across 12° of Latitude in Western Australia in 2010–11. A lot of other local marine life went belly up too including abalone, scallops, crayfish and fish. However the time of greatest risk for higher latitude West Australian coral is during La Nina, although the 2010-2011 La Nina was exceptional and exacerbated by anomalous conditions. See: La Niña forces unprecedented Leeuwin Current warming in 2011. Why is, "..the time of greatest risk for higher latitude West Australian coral is during La Nina...", mayI ask? See the 2nd peer-reviewed paper linked to above - the stronger trade winds during La Nina push more warm tropical water westward between the Indonesian archipelago & Australia (the Indonesian Throughflow or ITF). The 2010-2011 La Nina coincided with an anomalously strong southward Leeuwin Current (normally weak over summer) and weak southerly winds which flow in opposition to the Leeuwin Current. We appear to be in the positive phase of the Interdecadal Pacific Oscillation (IPO) which should reduce the volume of warm water transported through the ITF, but on the other hand the oceans are growing warmer. A La Nina forecast to develop later this year could prove interesting come next summer. "Because reef-coral have adapted tolerance to a narrow band of environmental conditions, bleaching can occur for a number of reasons, such as ocean acidification, pollution, excess nutrients from run-off, high UV radiation levels, exposure at extremely low tides and cooling or warming of the waters in which the coral reside. Typically these events are very localized in scale and if bleaching is mild, the coral can survive long enough to re-acquire new algal partners. So bleaching in itself is not something new, but mass coral bleaching on the huge scale being observed certainly appears to be, and represents a whole new level of coral reef decline." Coral reefs globally are in dramatic decline and the worldwide bleaching event currently underway is likely to kill quite a few more coral reefs. When one steps back to look at the 'big picture' it's pretty clear why coral reefs in the ancient ocean suffered crises and extinctions - a too-warm and acidified ocean was just too inhospitable for them to survive. Rob, Seriously. Reef forming coral expanded during the warm periods of the Mesozoic. Do you really want to argue coral suffered more from warmth than they have from the cold during the most recent ice ages?? Please provide the evidence? LInks? And indeed there has been episodic declines in coral reefs, but the greatest mortality has been due to tropical storms, predators like Crown of Thorns, or disease like White band. Dynamite and cyanide fishing have also been destructive as well as nutrient runoff from agriculture and seage. INstead you want to focus on bleaching, the smallest cause of mortality which is also part of their amazing adaptation mechanisms?!? Why do you disagree with the experts who promote the Adaptive Bleaching Hypothesis? [Rob P] - You mention the Mesozoic and make the flawed assumption that the marine revolution that occurred during this time, as it pertains to coral reefs, came about because of some hitherto unrecognized invulnerability to warm water. This is nonsense. Coral reefs likely acquired photosymbiosis during the Mezosoic and both the evolution of herbivorous marine feeders and the flooding of continental shelves occurred during this time. The development of photosymbiosis enabled coral to spread into oligotrophic (low nutrient) environments, and the flooding of continental shelves with warming opened up new territory for them. The arrival of mobile marine herbivores also meant coral were better able to complete with macroalgae and seaweed for space - indeed this is suggested as being the primary evolutionary driver during this period. I suggest this review paper as a starting point might prove illuminating: The Ecological Evolution of Coral Reefs by Professor Rachel Wood. There are simple reasons why coral have suffered or gone extinct because of (natural) global warming events in the past, a) surface seawater was too warm, and b) low carbonate ion abundance associated with ocean acidification made skeleton-building too energetically costly. Calcification rates drop, the coral skeleton becomes weakened and the reef cannot precipitate aragonite fast enough to overcome bioerosion. And this segues into why we are seeing coral reefs disappearing at an alarming rate today. You see that the scientific case explains both the past and present behaviour of coral reefs perfectly well. As for adaptive bleaching, it's not only me that disagrees with the adherents of this hypothesis, it's other coral reef experts and, more importantly, the observations. Intense coral bleaching events induce mortality soon after bleaching and thus dead coral are unable to acquire new algal partners. I'm sure you can agree that death makes adaptation impossible. Moreover, some of the reefs on the Great Barrier Reef (GBR) that survived the smaller-scale bleaching events of 1998 and the early noughties, have since died from the 2016 GBR bleaching event. Rob, You put words in my mouth. I never made "the flawed assumption that the marine revolution that occurred during this time, as it pertains to coral reefs, came about because of some hitherto unrecognized invulnerability to warm water." I asked "Do you really want to argue coral suffered more from warmth than they have from the cold during the most recent ice ages??" and you went off on a strawman tangent. The coral holobiont is constantly shifting the symbionts to maximize growth withing very narrow limits. Thus they are always stressed by an extreme El Nino event, whether happens in cooler water of the 1800s or warmer waters of the 21st century. Bleaching is part of their ongoing adpatation mechanism of expelling symbionts and acquiring new ones. This very well documented. Obviously you and others disagree with those experts that push the adaptive bleaching hypothesis. That why it is a professional debate. That polyps die is by no means a refutation of that hypothesis and such an argument is a bit disingenuous. A colony consists of 100s to millions of polyp clones. Most of the clones die after a stressful event, such as an abrupt cooling or warming. It's like leaves falling from a tree but buds, or in this case cryptic polyps reamain viable and in what is known as the Phoenix effect those clones with a better adapted symbiotic partnership can rapidly re-sheet the skeletal remains. Recovery can take weeks or years, and the reefs with the greatest moratliy, 90% or more, have recovered within 15 years. In the process those living polyps have been demonstrated to acquire better adapted symbionts. And the species that experienced the most bleaching during on EL Nino are observed to rsist bleaching during subsequent extreme events. However because EL Nino warm event are abrupt and temporary, coral will again shuffle and shift symbionts to be better adapted to the cooler pre El Nino events. They may then re-acquire the old symbionts and once again be vulnerable to a EL NIno. The coral that suffer the most are exposed to extreme variability as warm EL Nino waters are replaced by cold upwelled La Nina waters. That' s why the cool eastern Pacific has only ~18 species, while the Western Warm pool has over 500 species and more massive reefs. [Rob P] Warming of tropical waters from the last ice age to the present has been beneficial to coral reefs, but now that the tropics are reaching temperatures in summer that exceed the upper thermal tolerance threshold of coral that is no longer the case. This is why coral cores show no evidence of mass bleaching, on the scale we are currently witnessing, in the last thousand years or so until the latter part of the 20th century. Again the 'big picture' is the crucial point here. Bruno & Selig (2007) found that coral cover is declining at the rate of 1-2% per year irrespective of local conditions and Death et al (2012) discovered that half the coral on the Great Barrier Reef (GBR) has disappeared in the last 27 years. Only 10% of the GBR decline was attributed to bleaching mortality, which is a huge concern because the GBR has experienced a hiatus in bleaching due to the negative (La Nina-dominant) phase of the Interdecadal Pacific Oscillation (IPO). Continued ocean warming and a switch to the positive (El Nino-dominant) phase of the IPO suggests bleaching is going to become the major detriment to global reef cover over the next decade. When coral reefs globally are dying out at such an alarming rate, and when the oceans are warming and acidifying, it is absurd to offer a few limited exceptions as a counter argument. As time marches on, this global decline in coral cover will undoubtedly gather pace. Rob asserts, "tropics are reaching temperatures in summer that exceed the upper thermal tolerance threshold of coral that is no longer the case"
You are assuming that the upper thermal tolerance threshold has been reached but symbiont shuffling and shiftings has demonstrated that the upper threshold is moveable and new thresholds rapidly evolve. The fact that coral thrived during the Holocence Optimum when temperaturs in the Coral Sea were 2.1C warmer than today suggests you are very wrong about corals upper threshold. Coral must adjust their thermal boundaries to deal with cooler and warmer temperatures. The Great Barrier Reef Expedition of 1928-29 was concerned with bleaching and warming temperatures. Bleaching happens when ever there is an abrupt event that exceeds the prevailing climatology. If the extremes represent a trend the coral then evolve new symbiont partnerships best suited for that change. Most global bleaching events are temporary and will not be detected by cores sample. Furthermore as discussed in Hendy 2003 even massive mortality as observed in the 1998 El Nino bleachings are very difficult to detect without much much larger samples size within a location and from a wider range of locations. You absurdly suggest a growing pace of coral death based on extrapolating from a short term snapshot and dismissal of the evidence of symbiont shifting. But most reefs that suffered high mortality have recovered within a decade and have been resilient to subsequent warm events. Bleaching is a minor cause of moratlity and coral have had to evolve resilience and quick recovery to deal with more destructive forces such as tropical storms. [Rob P] - Symbiont shuffling is no panacea for the ongoing global demise of coral reefs. It's just another example of people in denial building a delusional belief around a 'kernel of truth'. Yes, symbiont shuffling is a real adaptation, but no it won't save coral reefs. The current precipitous decline in global coral cover might be a wee bit of a giveaway here. A glaring example is the recent assessment of the 2016 bleaching event on the Great Barrier Reef (GBR) - there is an average of 35% mortality on the central and northern reefs surveyed, an area making up two thirds of the entire GBR reef system. So one single bleaching event may have eliminated 20% of the reef. Fat lot of good symbiont shuffling did after GBR bleaching events of 1998 & 2002 eh? The Holocene Thermal Maximum is an interesting point. Was it warmer in the tropics during this interval? There doesn't seem to any consensus on this. The change in insolation due to orbital forcing would have made the tropics cooler-than-present, while outside the tropics, the Northern Hemisphere in particular, was much warmer. See the figure below from Marcott et al (2013) and note panel C) - the average annual insolation anomaly compared to modern-day. Rosenthal et al (2013) show that intermediate waters were much warmer, but the reef-building coral we're talking about don't live hundreds of meters deep. How much of this high latitude water returned to the equator via the subtropical cells, and how much did it affect the surface layers? The authors reconstructions show a very modest SST cooling 0.5°C in the Indo-Pacific warm pool from 9000 years ago to present (present being 1950 as is convention). By constrast, Marcott et al (2013) reconstruct tropical temperatures as cooler-than-present at the Holocene Thermal Maximum. 3. Coral bleaching from and El Nino ismuch like a devastating forest fire from a dry La NIna spell. There is a natural recovery and coral often recover from natural bleaching faster than a forest recovers from a nautarl fire. Northwest Australia's Scott Reef, the upper 3 meters lost 80 to 90% of its living coral and the disappearance of half of the coral genera. Yet researchers observed, “within 12 years coral cover, recruitment, generic diversity, and community structure were again similar to the pre-bleaching years.” A similar long-term study in the Maldives observed a dramatic loss of coral during the 1998 El Nino but by 2013 the reefs also had returned to “pre-bleaching values”. Although a reef’s recovery sometime requires re-colonization by larvae from other reefs, a process known as re-sheeting or Phoenix effect can facilitate a reef’s speedy recovery. Often a small percentage of living “cryptic” polyps with a more resilient symbiotic partnership were embedded within a “dead” colony and survive extreme bleaching. They then multiply and rapidly “re-sheet” the colony’s skeletal remains. [GT] Link connected. Please use the link tool on the editing menu to create links. Please provide more than a link to an image. It is unclear from the link what the source of the data is, who generated it etc. Jim, what is the source of that linked graphic? 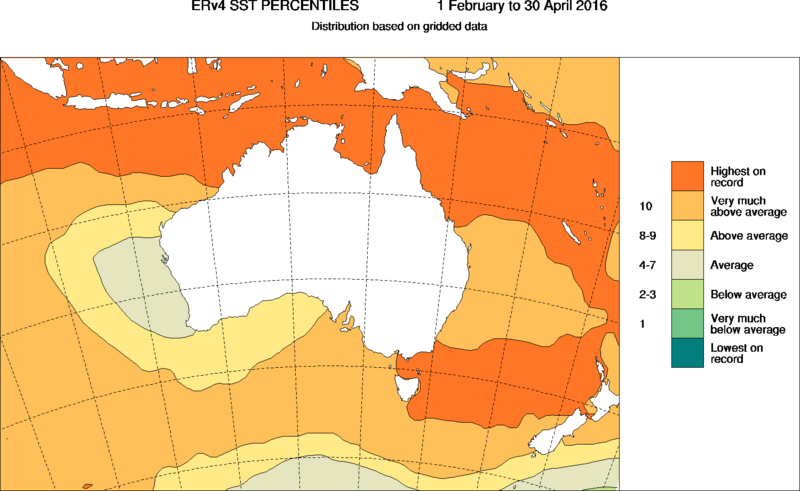 Is it from actual sea stations in the bleached area or just noaa gridded data over whole GBR. "what is the source of that linked graphic"
"please provide a link to Hendy 2003"
Very dated and taken out of context. Typical denier protocol and MO. 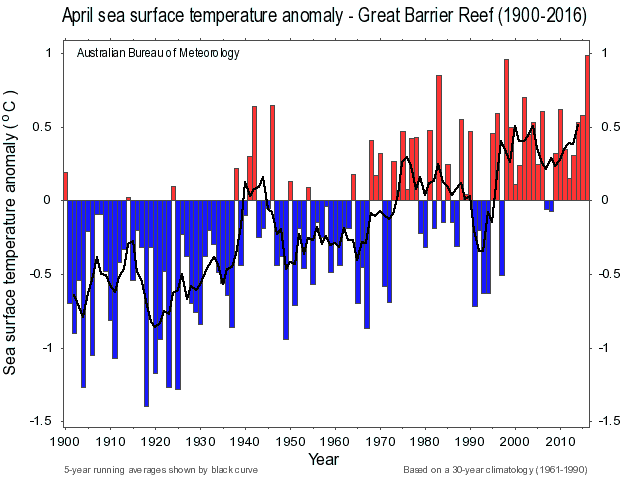 "There has been virtually no warming on the GBR"
Pity that your linked dodgy diagram scrupulously omits the most recent record warmth of 2015 and 2016. 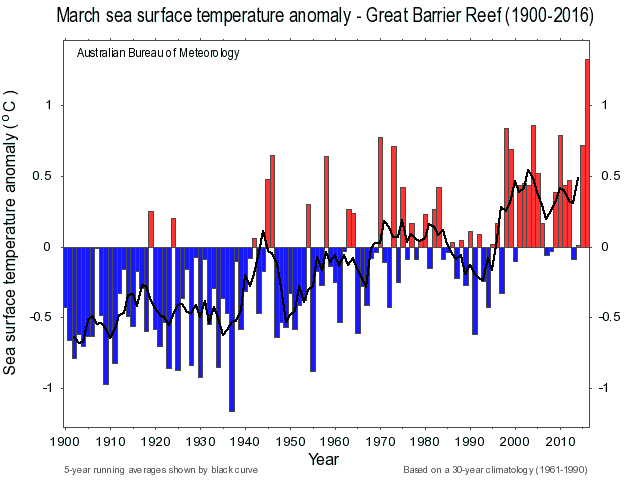 1) "There has been virtually no warming on the GBR"
The resort to a limited time span (1982-2014) when more extensive data is easilly available, or to July temperatures (when the bleaching occurred over the Feb-April interval) clearly represents cherry picking. 2) Hendy et al (2003) in addition to showing coral die of events in 1782-5 and 1817 also shows LIA GBR temperatures elevated to end 20th century values (figure 2, bottom panel). The LIA was a period of depressed global mean surface temperatures which need not have been represented by depressed temperatures everywhere and were not in the GBR. Including the missing evidence about LIA SST in the GBR shows the evidence that purportedly shows no temperature dependence in fact shows a relationship between die backs and elevated temperatures. 3) It is true that some reefs have recovered rapidly from die backs, but others have not, and some have recovered but only with a massive loss of biodiversity. One of the key factors in rapid recovery is the presence of nearby reefs with appropriate species to recolonize the site of the die back. In mass coral bleachings, the great extent of the bleaching makes that less likely. The greater the extent, therefore, the greater the long term loss in coral viability. That leaves aside the obvious point that these mass bleachings are occuring at current temperaures. If the target for restraining global warming is met, we can expect an additional 1 C increase in global Mean Surface Temperatures relative to 2015. If not, it will be much more than that. The likely consequence is that we will experience mass coral bleachings not every decade or so, but every few years - meaning the bleachings will occure of reefs not yet recovered from the last bleaching. The consequence will be a long term loss of vitality for coral reefs - and that is considering only the effects of temperature based mass bleachings. A note that even after another hot summer of coral bleaching, this time without an El Niño, Jim Steele doesn't seem to have learned much. He's written an article on the web entitled "Falling Sea Level: The Critical Factor in 2016 Great Barrier Reef Bleaching!" attacking Hughes et al (2017). Global warming and recurrent mass bleaching of corals. Steele's article has been referred to by James Delingpole and others, presumably because it tries to blame anything other than sea temperatures for coral mortality despite their evident close relationship. The article about coral mortality in Sulawesi he references would not explain bleaching and its authors support the overall picture of thermally-induced bleaching and mortality. One of his suggestions is that Hughes's demonstration of mass mortality of the northern GBR was based entirely on aerial surveys. That is false, as can be seen in reports for example in SciAm or New Scientist. Although this has been pointed out to him, Steele has as of 19 April yet to correct these errors. La Niña periods today are actually warmer than El Niño periods were 40 years ago. BS. Here you can see the ENSO data going back seventy years and the zero degree anomaly line hasn’t changed at all. For your “expert” to be right, it would’ve had to have gone up by two degrees Celsius. Your problem is that ocean warming is far less than amospheric warming - and it is mostly at high altitudes. But yet somehow it is responsible for bleaching at mid altitudes. I‘m in over my head as usual, but this guys *rules* the climate discussions in an FB group of over 30,000 people. If he is wrong - and I’m guessing he is - I’d really like to prove it. You can see that any no. of La nina blue dots are warming than past El nino red dots. I suspect that he is confused with how the ENSO anomaly condition is defined. Figure 5 in this paper (esp 0-700) does not support his assertion that ocean warming is mostly high latitude. The sea surface certainly warms slower than land, but it sure is warming. 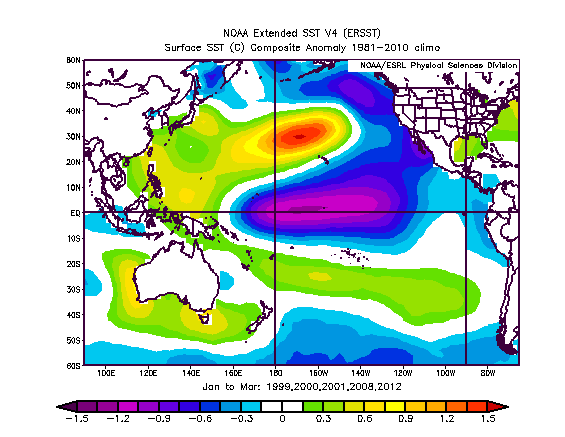 Here is anomaly in SST to 2012 for tropical area, black line is for coral reef locations from here. @scaddenp Thank you so much! After being told I'm "suffering from confirmation bias" and "not interested in science", it was a real pleasure to serve that guy with this information this morning!